I’m pleased to announce my two new books are on sale now. They can be found online through the links below and also, of course, to order through all good bookshops. You can download my psychological suspense novel Mystical Circles here, and you can buy the paperback here. My inspirational writer’s guide Perilous Path can be downloaded here, or ordered as a paperback here. There are many ways to help an author besides buying the books! You can get the word out by sharing, recommending and reviewing online. And in the real world you can recommend titles to your own book club for discussion; or order the books through your local library to increase their awareness and encourage them to order copies for their stock. It all helps. And if you do support me in any one of the above ways, thank you very much! Luminarie editions of Mystical Circles and Perilous Path Out Today! Posted on September 5, 2017 Categoriesa passionate spirit, book reviews, Books, British, British psychological suspense writer, creative writing, inspiration, life, literature, Mystical Circles, New psychological thriller fiction, paranormal thriller fiction, Perilous Path, psychological suspense fiction, SC Skillman, SC Skillman Author, spirituality, UK, WritingTagsblog, blogging, Guest post, inspiration, mystical circles, new editions, Perilous Path, SC Skillman, writing3 Comments on Luminarie editions of Mystical Circles and Perilous Path Out Today! 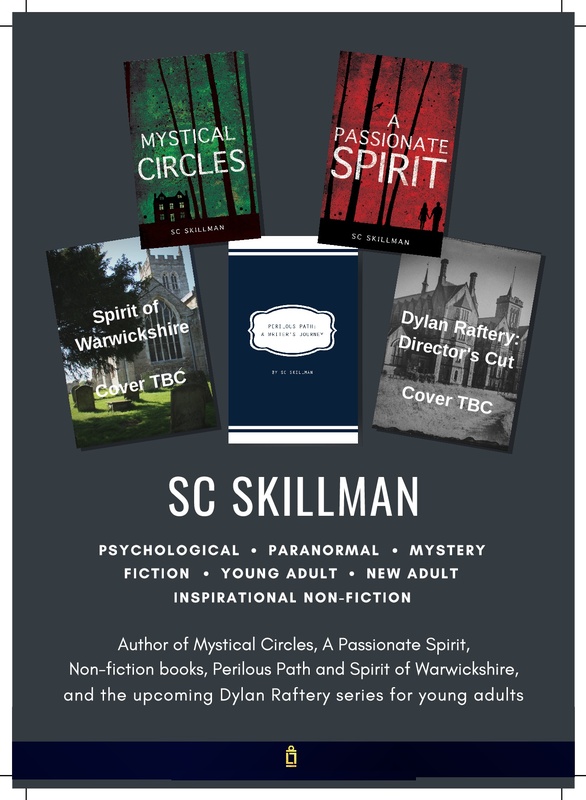 Today is publication day for my two new Luminarie editions Mystical Circles (psychological suspense novel) and Perilous Path (inspirational writer’s guide). Both are widely available through online retailers, or to order from bricks-and-mortar bookstores. They are available both as ebooks and as paperbacks. And from 8 September both books will be on Goodreads giveaway to UK readers. Yes – I have 10 paperback copies of each book to give away to the lucky winners! The giveaway will last for one month. If you live in the UK and you’re a Goodreads member why not hop over there and enter the giveaway. And if you do win, and you read the books, please do remember, we authors always love Amazon reviews, no matter how many stars, and whatever you choose to say in an honest review. And that’s not all my news. Today (5th September 2017) is also Day 5 of my Blog Tour. Today I’m on Sue Vincent’s Daily Echo and the title of my guest post is “Inside a spiritual hothouse.” Hope to see you over there!